There is not a great deal of information about Mount Blair Show. It seems to have been more of an agricultural show rather than a “gathering”. Did this show become part of the Strathardle Gathering at some time? The picture would indicate, from the shape of hills, that is was taken somewhere in Glenshee, so perhaps it was entirely separate. 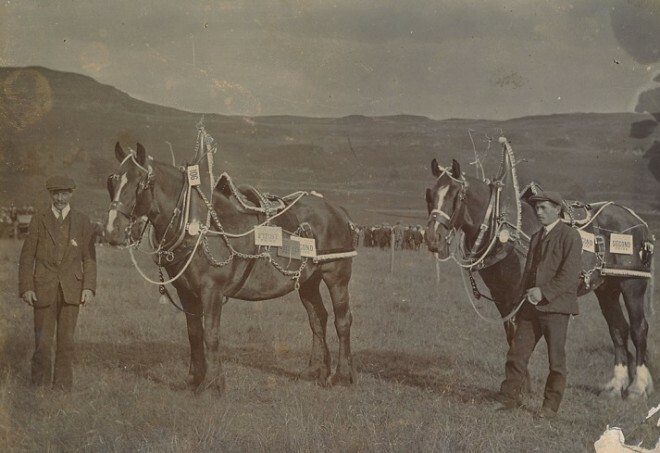 The Mount Blair Show was held on the Saturday after the Braemar Gathering which was on a Thursday at that time. It appears to have stopped for World War Two and there are no memories of it after the war. The location has not been determined but seems to have been in the Blacklunans area somewhere between Easter Bleaton and Milton of Blacklunans. It was not incorporated into the Strathardle Gathering which added its own Agricultural Show in the early 1960s.